Things are moving along nicely in the Locost world. 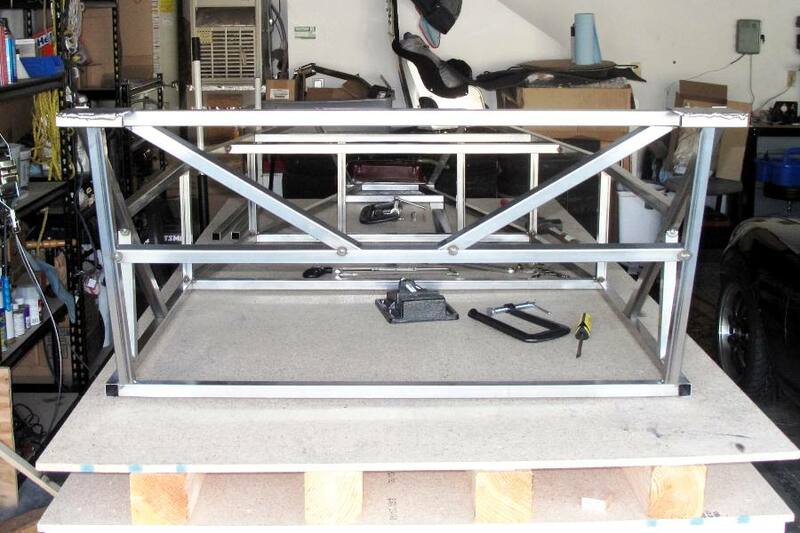 We have a hunk of metal in the garage that's starting to look an awful lot like a Locost space frame chassis. Our cardboard box of frame tubes that took months to fill is almost empty after less than a week, and the frame is getting bigger and stronger by the day. We tacked on a lot of tubes and permanently welded a few, and even though I'm sure none of our beads will make the Welder's Weekly hall of fame, we melted the metal all the way through which is our only real concern. For some reason our building table has warped a little over the past few days. It's no longer as perfectly flat as it was when we started. Stupid particle board. Not only does it warp, but it also apparently won't take more than a few thousand degrees of heat before it starts to char. How lame is that? It's not a big deal since the frame is pretty straight now, and with most of the tubes attached that's unlikely to change. Still, for $16.95 you'd think you could expect more from Home Depot. At least the frame is true. A popular method for checking straightness is to measure diagonal distances across the frame, like for example corner to corner. It's a good idea and we did that a few times, but I'm not sure it's accurate to more than an eighth of an inch or so. And you can't do it for everything. For us, a better method is to stand back and sight a line of position on parallel tubes. For instance, is the O-tube (top rear bar) parallel with the LC tube (top of the nose)? Are the K1 and K2 tubes parallel? Are all the bottom tubes lined up? 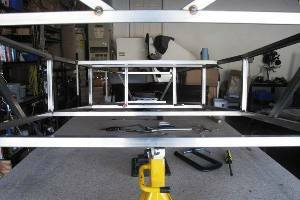 Years ago I built a lot of airplane wings, and by far the best way to make sure a wing wasn't warped or twisted was line of sight. I suppose you could do the same thing with lasers if you wanted to be all high-tech about it. But light is light, and it all moves in a straight line. Except in the presence of a gravitational field. Actually even then it still moves in a straight line, but gravity bends space so the light appears to curve. But Earth's gravity isn't really strong enough to have any relativistic effects on a Locost frame, and in any case you probably didn't want to know all that in the first place. 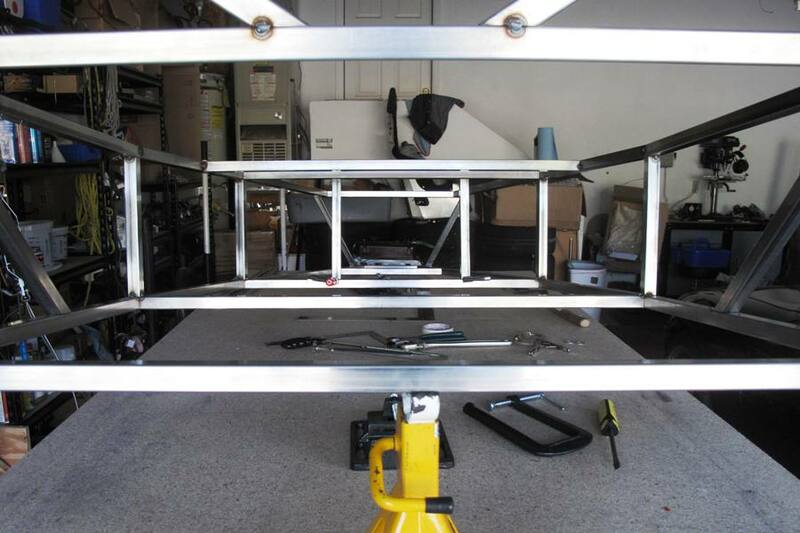 Before we tacked on any tubes that would permanently lock a section of the frame into place, we always made sure to take a line of sight from all angles. Sometimes we had to nudge a tube or two to get things to line up, but we checked before and after each tack weld, and we're really glad we did. The frame looks great, or at least better than we ever thought it would. Of course this is just the beginning of the build and we'll have plenty of opportunities to screw up later, but at least we can enjoy our little accomplishments for now. 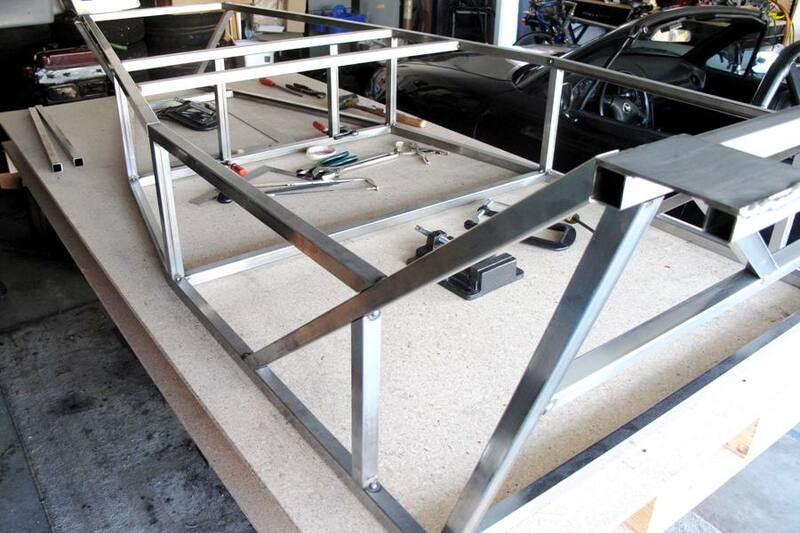 Last summer when we were just getting started on this project, the idea of welding together a steel space frame seemed like something we might actually be able to do. After all, we'd built a wooden Locost frame and it wasn't that hard. And we'd taken a welding class. So it seemed feasible. Anything beyond the frame, however, was questionable. To go from a welded frame to a rolling chassis involves many steps, all of which require some kind of miracle to occur. Or if not a miracle, then many, many do-overs. So we didn't feel like our odds of completing this build were very high. In the last couple of weeks that seems to have changed. I'm not sure why, but I think it's a lot of little things, like getting the donor stripped and out of here, buying an angle grinder, putting together a build table, and getting over our weld-o-phobia. We still have a few obstacles ahead, but we had a lot of obstacles before this, too. One by one they got knocked down. So maybe it's possible. 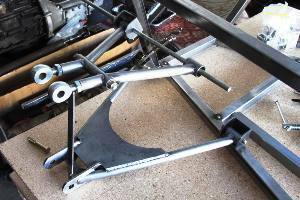 Between welding sessions we clamped on a few suspension brackets and attached the A-arms. They looked great. 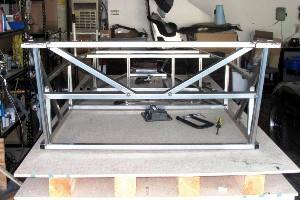 Of course before they're permanently attached they have to be carefully jigged, and we don't want to risk any tubes moving even slightly during welding, so it would be stupid to weld or even tack the brackets in place before the frame is all done. Not that stupid would necessarily stop us from doing something cool. But we still have lots of other cool and even fun stuff to do on the frame yet, so I guess we'll wait to do the suspension at the appropriate time.